When a company such as communications industry infrastructure provider NeuStar needs an upgrade to its network operations center (NOC) and conference center, you can be sure the final result will be state-of-the-art. The network operations center at NeuStar needed both updating and a technology centerpiece. The company, headquartered in Sterling, VA, provides clearinghouse services, including databases and systems for workflow and transaction processing. The newly installed NOC allows NeuStar to continue giving customers access to these databases through standard interfaces, which allow service providers to exchange operationally essential data in an efficient, secure, cost-effective, and competitively neutral manner. "The NOC upgrade was needed for multiple purposes, including expansion for increased capacity and functionality, to accommodate our overall data center expansion plans and in general to provide a more modern 'look and feel' since our old NOC was starting to show its age," says Bryan Carter, VP procurement and commercial real estate, who has been with NeuStar since May 2002. "The NOC monitors NeuStar's production infrastructure for problem incidents," Carter explains. "When incidents occur, they have standardized operating procedures for handling those problems. This may involve the NOC doing troubleshooting or escalating issues to other technical teams as needed. This is all part of the NeuStar Incident Management Process, which the NOC is responsible for managing." 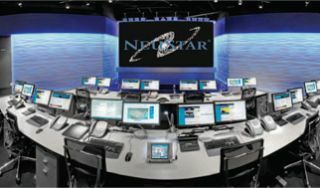 NeuStar turned to design-build integration firm Professional Products, Inc. (PPI) to facilitate the audiovisual design and buildout of the NOC, which took roughly 14 months to complete last spring. Based in Gaithersburg, MD, PPI specializes in advanced video, audio, data, and control systems, providing a full array of hardware and software solutions for training, broadcast, video on demand, and presentation. Scott Mauriello, applications engineer with PPI, helps provide complete systems design packages and system engineering for companies like NeuStar. "The NOC allows NeuStar to display and monitor their proprietary information," he says. "They can call up an infinite number of applications at any size." Mauriello says the NOC contains ten workstations and nine rear projection cubes aligned in a 3x3 stack. Each Planar Clarity SP Series C-70PW rear-projection DLP cube features a 70- inch diagonal 16:9 screen with 1080p performance, and is capable of displaying either multiple selected images simultaneously or one large image. These images can come from applications installed on the Christie Total View Controller 120 series high-resolution video processor, DVD programs, cable, or satellite TV. The main use of the system is to allow different news channels and proprietary applications to be displayed during 24/7 monitoring as necessary for routine and emergency operations. In the passive mode, the electric glass wall allows visibility from the conference room into the control room. Separated from an adjoining conference room by an electric glass wall, touchscreen controls are available in both rooms of the NOC. The user can select either a frosted or clear look, depending on the level of privacy desired (see sidebar). The conference room also has a Pioneer PDP-6070 60-inch plasma monitor with a 16:9 widescreen aspect ratio that shows content from various sources such as PC, DVD, CATV, satellite, or video routed from the NOC. Some interesting challenges occurred during the project due to the openness of the space, according to Mauriello. "The ventilation for the video wall was a challenge," he says. "This required the general contractor (GC) to run A/C underneath the raised floor for proper cooling. PPI coordinated with the GC, architect, and mechanical electrician (ME), and provided specs on the heat dispersion on the cubes and the racks that house the AV gear underneath the cubes. A technical issue that we overcame was having the processor house the client software application so that any computer on the network can go and pull the applications and download the software to display info on the NOC screens." Since being incorporated in 2001, the City of Aliso Viejo, CA, has recorded its city council meetings using a single microphone and a cassette tape recorder; nothing else. So when the city decided to build an updated council chamber inside its existing office space, the council seized the opportunity to bring their AV system up to professionalstandards. The result: Thanks to the efforts of systems integrator TV Magic of San Diego, CA, the Aliso Viejo Council Chambers are now equipped with a new full featured AV system that doesn't intrude on the room's aesthetics. "With the council chamber being built from scratch, we wanted to upgrade our AV facilities to a professional level," says Glenn Yasui, director of administrative services for the City of Aliso Viejo. "But we also wanted the installation implemented as discreetly as possible, so that the AV equipment wouldn't dominate the room's overall look." To do the installation, the City of Aliso Viejo tendered an RFP for $135,000. The winning bidder was TV Magic. A full-service broadcast and AV integrator, TV Magic's previous clients include the City of Mission Viejo, CA (council chamber); Crystal Cathedral Ministries ("Hour of Power" production studio); and Foothills Christian Church (church AV system). In theory, the installation should have been easy, because Aliso Viejo was basically "doing new construction inside an existing office building," says Bill Cyree, the TV Magic design engineer in charge of the project. "But, in practice, space was a real issue, because the client didn't want the equipment to be more visible than necessary. In particular, setting up the council's plasma display so that it was visible to them yet invisible to the audience was a real challenge." When the electric glass is activated, the glass wall becomes translucent, creating an attractive wall appearance while obscuring the view into the control room. AV system to be as simple to operate as possible, even though it had to be capable of managing inputs from plugged-in laptops at various access points and automatic level balancing between the council's three microphones," he adds. "This is why we chose a Crestron touchscreen system and located the bulk of the AV system next door in a small equipment room." That's not all: "The system had to be prewired for four video cameras," says Yasui. "We didn't add cameras during the installation, because shooting the meetings is not something that council wanted to do at this time." The audience visuals inside the Aliso Viejo Council Chamber are displayed on two 50-inch Panasonic TH-50PH10UK plasma HDTVs that are suspended on either side of the chamber, using Peerless PLCM1CP ceiling mounts. Meanwhile, the seven-position councillors' table is equipped with seven HPL1506 15-inch LCD monitors; one for each of the six councillor positions plus the mayor. The entire system is controlled by a Crestron TPS-4000L 10.4- inch touchscreen, flush-mounted at the centrally located mayor's position. "The councillors' table is basically a big round dais, and the front of the dais is raised about 12 inches above the actual work surface," Cyree says. "It's designed to look like elegant yet simple wooden furniture. From the audience's point of view, the monitors sit just slightly above the wood. You can hardly see them." The monitor inputs come from the equipment room next door. It is equipped with a Denon DN-C310 professional DVD player, an Extron CrossPoint 300 124HV 12x4 RGBHV/audio switcher, and an Extron DVS304A four-input video and RGB scaler with audio switching. Signals from the three laptop stations - one at the center dais (mayor's position), and one each on the two staff tables facing the dais - are fed into this room, then distributed to the monitors in the chambers. "Since we had to feed seven monitors on the councillors' dais using a small conduit, we decided to send a single feed into the dais, then amplify/ split the signal at that point using a Kramer VP-15 distribution amplifier," says Cyree. "This allowed us to effectively feed all seven monitors using a single piece of coax cable." Audio is played through a QSC CX108V 100-watt, 8-channel amplifier located in the equipment room, and fed to JBL Professional Control 26CT ceiling loudspeakers. Each of the councillors has his or her own Shure MX418- S/S gooseneck microphone, and there is one located at each of the two staff tables; providing nine in all. "The audio levels are automatically balanced by the Biamp Nexia CS digital signal processor, which has 10 mic/line inputs and 6 mic/line outputs," Cyree says. "This means that no one has to manually balance the levels; keeping things nice and simple, as the Client requested." The audio from each meeting is recorded using a Marantz PMD-570 Pro digital recorder. This is a solid state recorder that dubs directly to removable Flash memory cards. After the meeting is over, the card is removed and taken to a clerk. They insert it into the clerk's PC and make a transcription using Windows Media Player. The audio is then dubbed to the city's server, with the Flash card being stored in the city archives. To provide audio to the hearing impaired, the Council Chambers have been equipped with a Listen LT-800-216 stationary transmitter, LR-400-216 display receiver, and LA-165 wireless headsets. For $135,000, the City of Aliso Viejo has transformed its city council AV system from primitive to professional. "For what we got, we believe this to have been money well spent," says Yasui.